Thisstory was updated at 7:00 a.m. EDT. CAPE CANAVERAL, Fla. – Sixastronauts and their shuttleAtlantis are safely back on Earth after returning NASA and its partners on apath to complete the InternationalSpace Station (ISS). 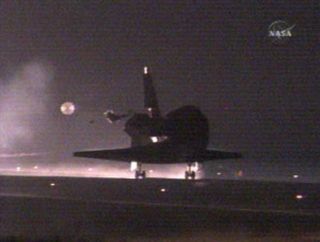 Atlantis touched down at the Shuttle Landing Facility here at NASA’sKennedy Space Center (KSC) before dawn at about 6:21 a.m. EDT (1021 GMT) after187 orbits and a 12-day mission that kick started ISS construction. Jettand his STS-115 crew delivered the first new additions to the ISS since late2002: a new set of wing-likesolar arrays and two massivetrusses that weighed in at 17.5 tons before the flight’s Sept.9 launch. Atlantis fired its engines to plunge Earthward at about 5:14 a.m. EDT (0914GMT), loosening two resounding sonic booms that pierced the early morning skybefore its wheels touched down on Runway 33 here while the orbiter traveled ata speed of about 225 miles per hour (360 kilometers per hour). Returning to Earth with Jett were shuttlepilot Chris Ferguson and mission specialists JosephTanner, DanielBurbank, HeidemarieStefanyshyn-Piper and Canadian Space Agency astronaut StevenMacLean. Their landing was delayedone day to allow a third survey of their heat shield after several mysteriousbits of debris were spotted floating around the orbiter this week. Astronautsaboard the ISS watched Atlantis as it streaked through the Earth’satmosphere, at times backlit by lightning. The two spacecraft were about 200miles (321 kilometers) apart at the time Atlantis performed its deorbitmaneuver. “Thebrightest thing through the window by far is the orbiter itself, with itscontrail behind,” ISS Expedition13 flight engineer JeffreyWilliams told mission control, adding that the station crew turned off thelights in the U.S.-built Destiny laboratory during the descent. Theirsafe landing concluded NASA’s 116th shuttle flight – andthe 27th mission for the Atlantis orbiter – after 11 days, 19hours and six minutes. It also marked NASA’s 15th night landing at KSCand the 21st unlit return of an orbiter overall. Thespaceflight marked NASA’s third shuttle flight since the 2003 Columbia accident. Atlantis’STS-115 flight marked the first of about15 critical missions to build up the space station’s electrical gridand then haul up new laboratories and modules. Atlantis astronauts staged threespacewalks in four days to install the Port3/Port 4 truss segments to the space station’s port side and unfurltheir solar arrays to their maximum, 240-foot (73-meter) wingspan. Theytraveled about 4.9 million statute miles during their spaceflight. “We achieved a new record in assembly of a major component in a minimumnumber of spacewalks,” Hale said of the mission. Atlantis’ STS-115mission was the second in three months to visit the space station’s Expedition13 crew – commanded by Russian cosmonaut PavelVinogradov, with NASA astronaut JeffreyWilliams and German spaceflyer ThomasReiter – and left the orbital laboratory a bit off-kilter withit’s left-leaning slant. With Atlantis’ safely back on Earth, NASA will now turn its attention tothe orbiter’s sister ship Discovery, which is being primed for a Dec. 14launch, though shuttle officials hope the vehicle can be ready a week early. Discovery’s STS-116 mission – commanded by NASA shuttle veteran Mark Polansky – will ferry a new ISS crewmember SunitaWilliams to the station, haul a new portside section for installation andbegin the electrical rewiring necessary for a series of missions to ready thestation’s infrastructure for futureassembly. “There are about six in a row here that we really need to pull off in afairly rapid order without major problems to keep assembly going,” Halesaid. The solar arrays unfurled during Atlantis’ STS-115 mission, representingabout one-fourth of the station’s final power grid, will begin feedingthe outpost in earnest during the December shuttle flight. Atlantis and the STS-115 crew’s addition of new trusses and solar arraysto the ISS are yet another leap forward for the station, which saw NASA’sfinal post-Columbiaaccident shuttle test flight and a resumptionof three-astronaut crews during the Expedition 13 mission. “Tocome back to a crew of three and get the shuttle flying again, and to continueassembly, hopefully it sets us on a path to efficiently get done with theassembly so that we can then be prepared to move on and fulfill the vision ofspace exploration,” Jeff Williams said. NASA will hold a post-landingnews conference at about 8:30 a.m. EDT (1230 GMT), followed by commentsfrom entry flight director Steve Stich at 9:30 a.m. EDT (1330 GMT). Shuttle commander Brent Jett and his STS-115 crew aretentatively scheduled to comment on their flight on NASATV no earlier than 11:30 a.m. EDT (1530 GMT). You are invited to follow the progress of Atlantis’STS-115 crew via SPACE.com’s NASA TV feed, which is available by click here.